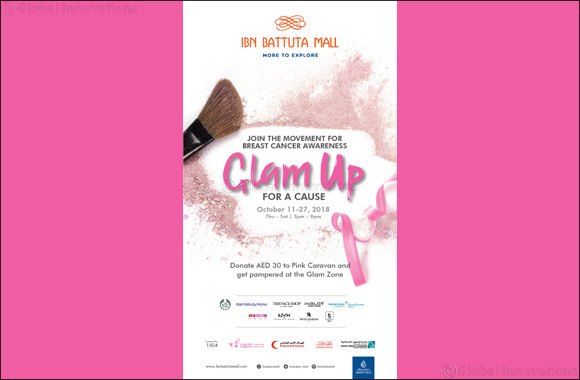 Dubai, 9 October 2018: Ibn Battuta Mall in Dubai is tying up with Pink Caravan to promote breast cancer awareness and treatment through a unique, beauty-themed Glam up for a Cause campaign this October. Running from 11 until 27 October, the campaign will help spread awareness about the importance of self-examination and dispel myths associated with breast cancer. The event is being held in collaboration with Pink Caravan, a UAE-wide breast cancer awareness initiative under Friends of Cancer Patients Society. During the three-week campaign, nurses from Mediclinic at Ibn Battuta Mall will advise on the importance of self-screening, with general health checks – including glucose, blood pressure and cholesterol monitoring, and body mass index measurement – also available. To take advantage of these services, and receive complimentary pampering from leading beauty and cosmetics brands at the mall, simply donate AED30 towards building awareness and supporting breast cancer treatment in the UAE. All proceeds will go directly to the Pink Caravan initiative. NBar, The Face Shop, Nyx, Swiss Arabian and Inglot will all offer free beauty services and products and interactive make-up tutorials to participants, while t-Lounge by Dilmah will support the event by highlighting the importance of inner beauty and health. Glam up for a Cause at Ibn Battuta Mall’s China Court from Thursday to Saturday from 3pm to 9pm between 11 and 27 October.